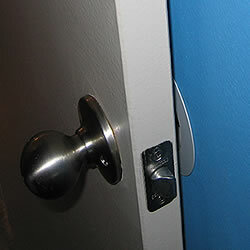 Add door knob clearance when widening doorways with swing clear hinges. Protect your walls from door knob intrusion! Designed to work with our swing clear hinges, our door knob pockets add clearance when space is at a premium. For interior doors, fits most standard round doorknobs.